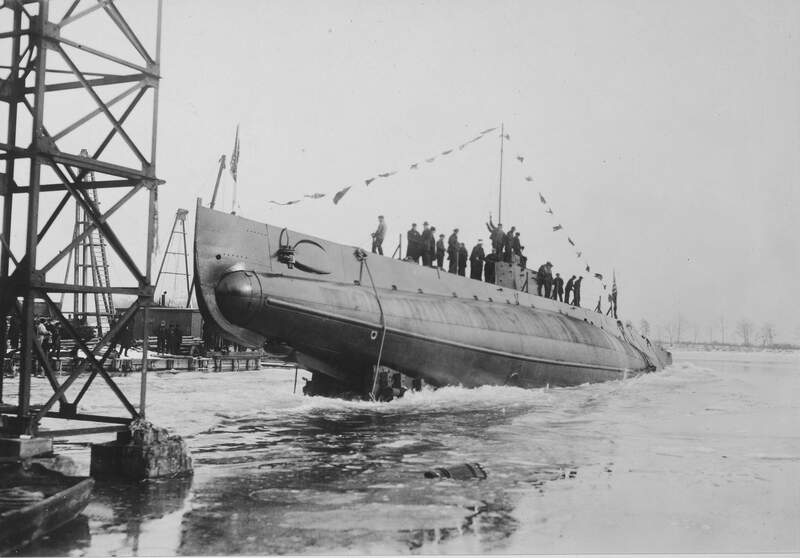 O Class Submarine: Laid down, 14 February 1917, at Fore River Shipbuilding Co., Quincy, MA. 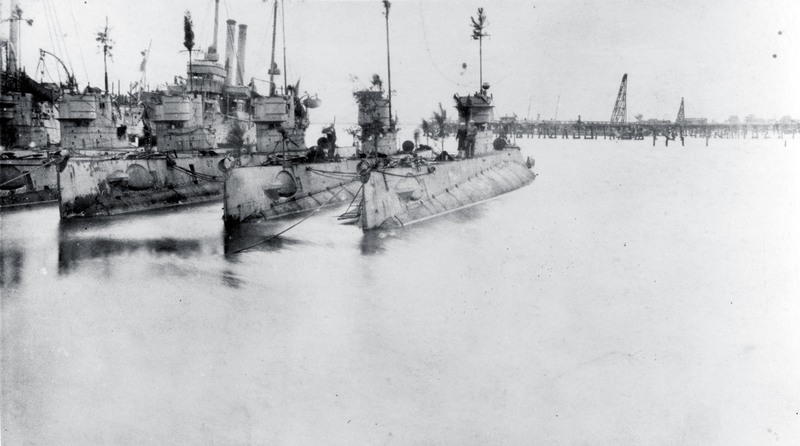 ; Launched, 16 December 1917; Commissioned, USS O-7, 4 July 1918; Designated (SS-68), 17 July 1920; Reclassified a 2nd line submarine 25 July 1924 and to a 1st line submarine, 6 June 1928; Decommissioned, 1 July 1931, at Philadelphia, PA.; Laid up in the Atlantic Reserve Fleet; Recommissioned, 12 February 1941, at Philadelphia; Decommissioned, 2 July 1945; Struck from the Naval Register, 11 July 1945; Final Disposition, sold for scrapping, 22 January 1946, to North American Smelting Co., Philadelphia, PA.
425k Launching of the O-7 (SS-69), 16 December 1917. 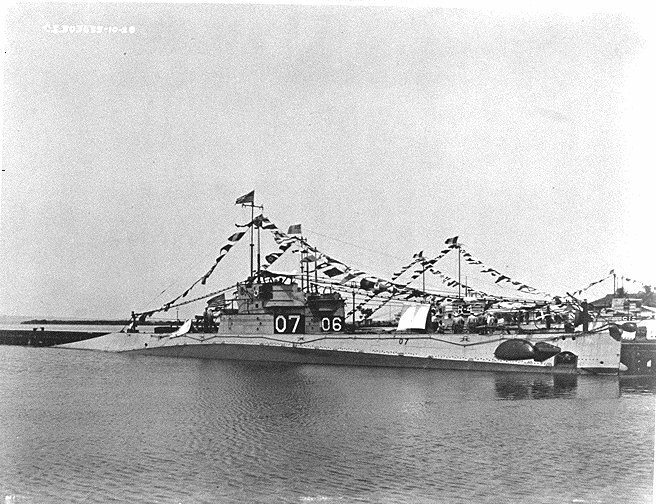 122k Starboard side view of the O-7 (SS-68) underway, probably during her trials in 1918. Note the triangular marking on her fairwater. USN photo courtesy of ussubvetsofwwii.org. Text info courtesy of USNHC photo # NH 44552. 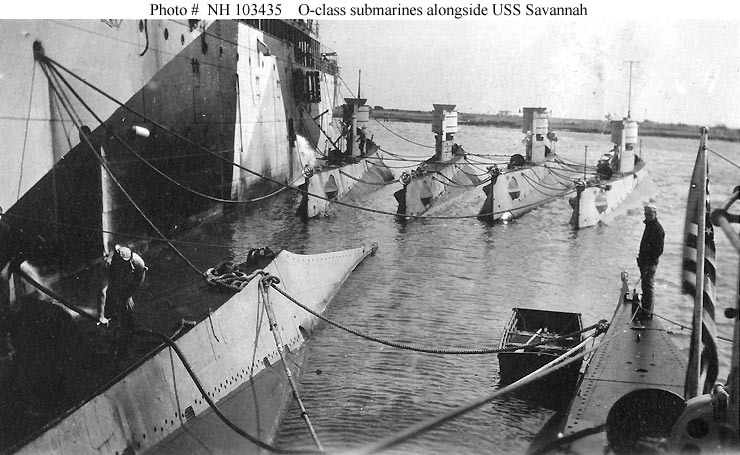 74k O-7 (SS-68) alongside Savannah (AS-8) with other submarines, circa Autumn 1918. The view looks aft from O-7's foredeck. Note the pattern camouflage painted on Savannah's side. US Naval Historical Center photo # NH 103434. Collection of Christopher H.W. Lloyd. Donated by Virginia Agostini, 1990. 85k Alongside Savannah (AS-8) at Cape May, New Jersey, circa Autumn 1918. 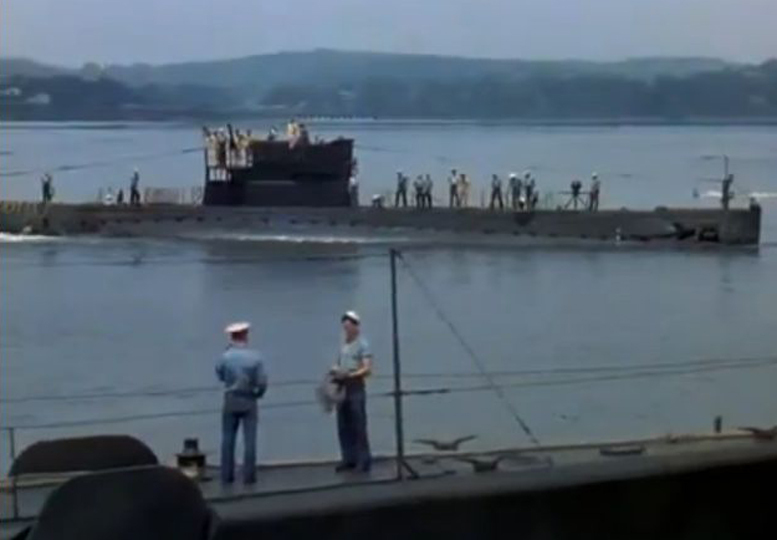 O-7 (SS-68) is partially visible in the left foreground. Note the pattern camouflage painted on Savannah's side. US Naval Historical Center photo # NH 103435. Collection of Christopher H.W. Lloyd. Donated by Virginia Agostini, 1990. 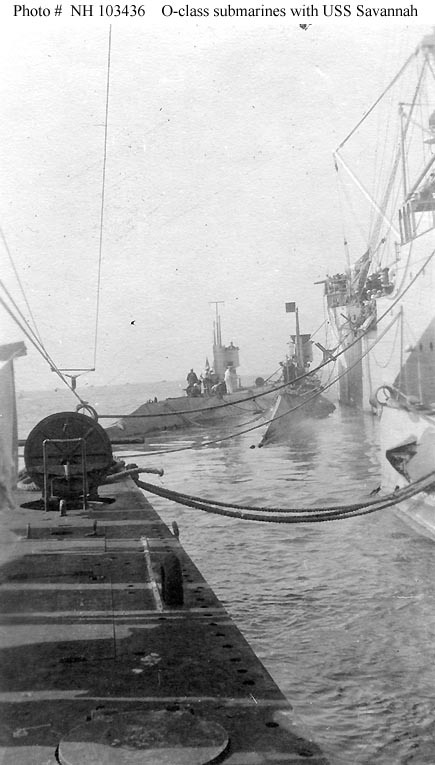 62k Alongside Savannah (AS-8), circa Autumn 1918. 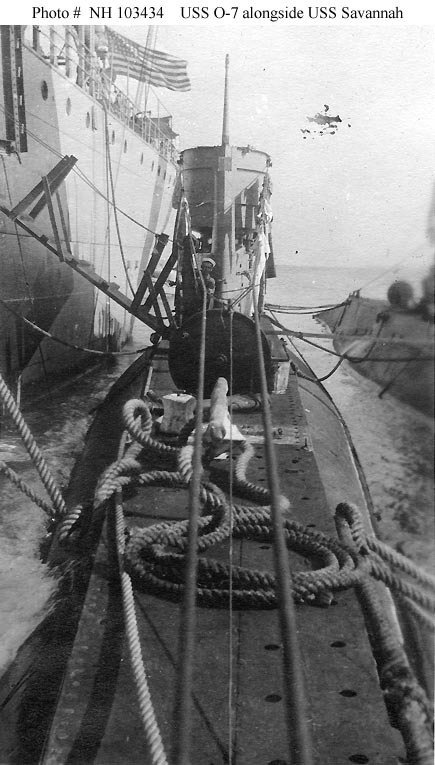 The photograph was taken from on board another O-class submarine. 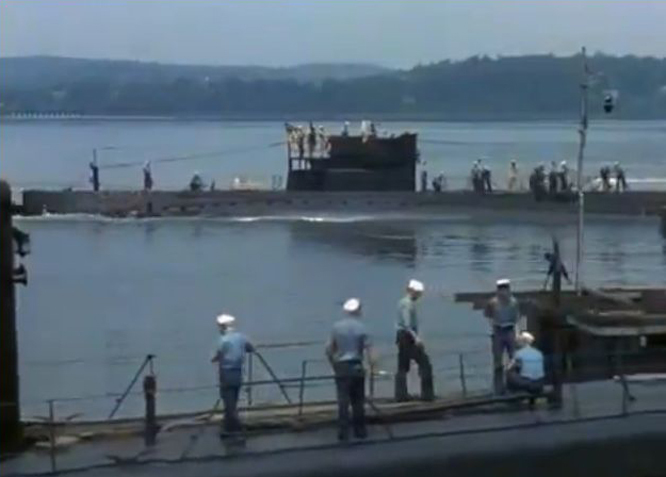 O-7 (SS-68) is in the right center, directly alongside Savannah.Note the pattern camouflage painted on Savannah's side. US Naval Historical Center photo # NH 103436. Collection of Christopher H.W. Lloyd. Donated by Virginia Agostini, 1990. 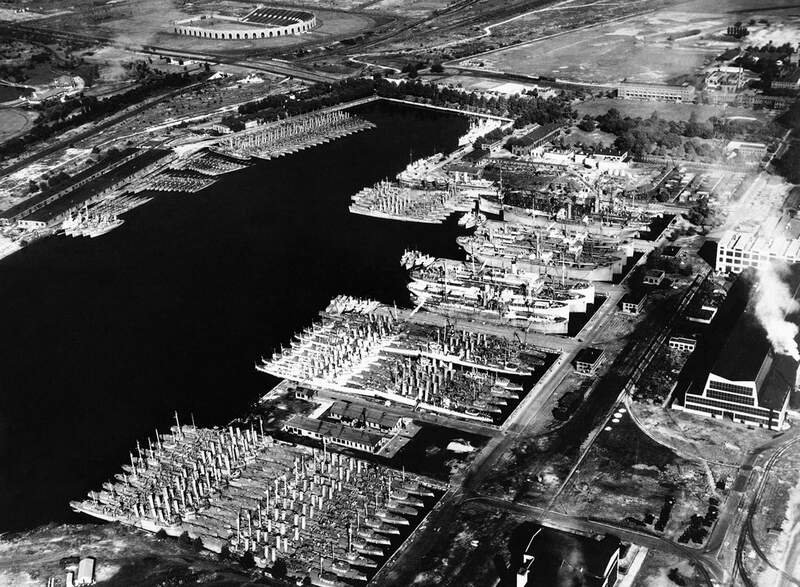 > 57k O-boats at the Charleston Navy Yard, South Carolina, circa Christmas 1918. 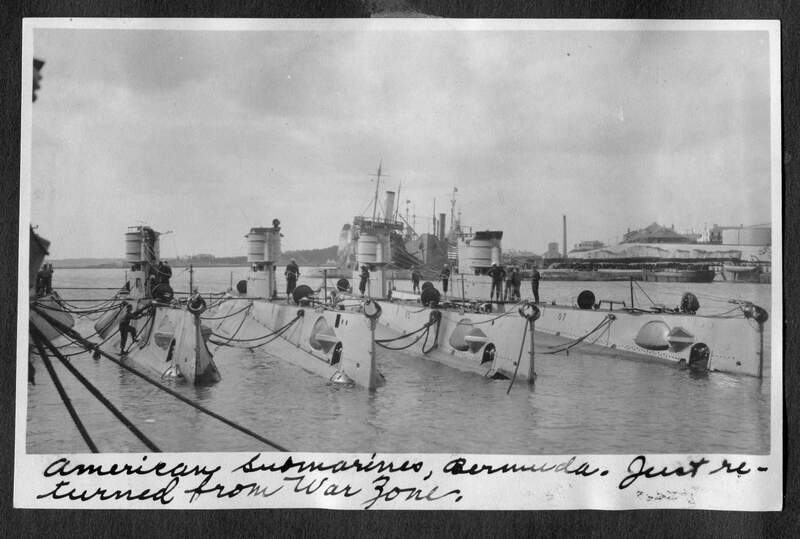 Note holiday greenery displayed on the submarines' superstructures and masts. O-10 (SS-71) is partially visible at the extreme left. 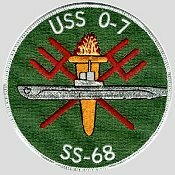 O-7 (SS-68) is in the middle of this nest of five submarines. Hartford, the Navy Yard's station ship, is in the background. US Naval Historical Center photo # NH 103437. Collection of Christopher H.W. Lloyd. Donated by Virginia Agostini, 1990. 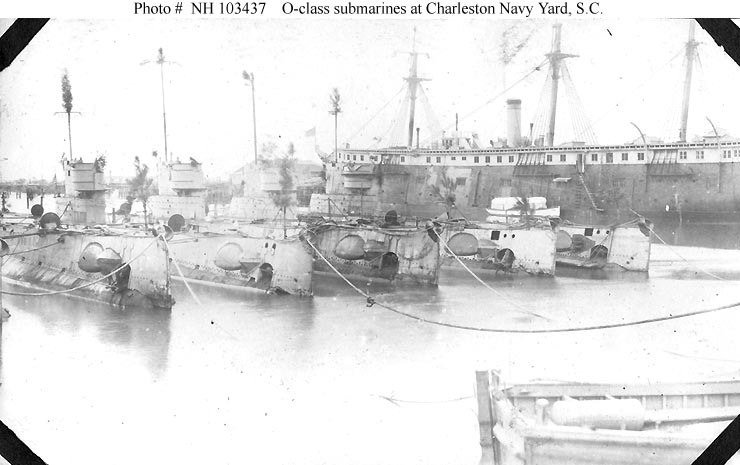 746 O-boats of Submarine Division Eight at the Charleston Navy Yard, South Carolina, circa Christmas 1918. 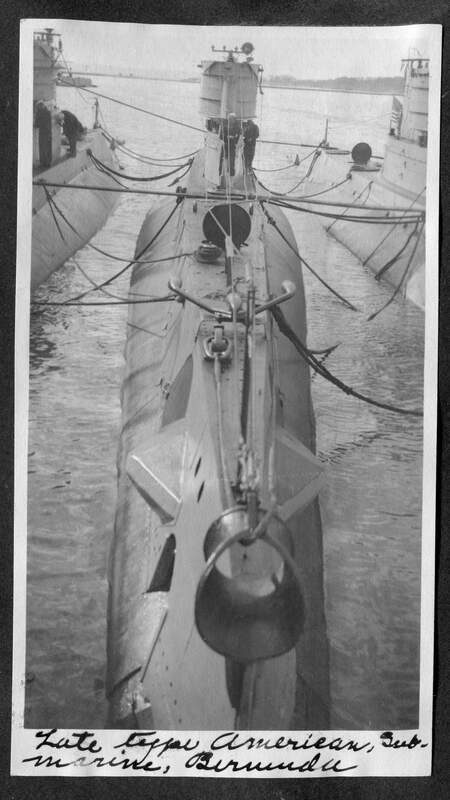 Note holiday greenery displayed on the submarines' superstructures. 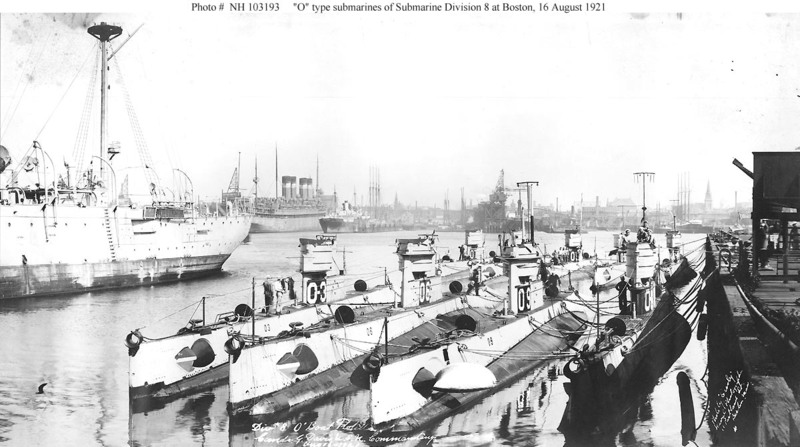 The three outboard submarines are (from left to right): O-6 (SS-67); O-3 (SS-64); and O-7 (SS-68). 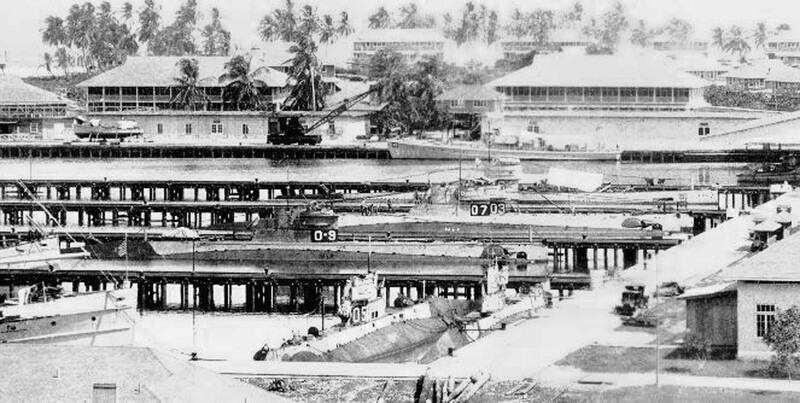 The two-stack ship in the left center distance is probably Dubuque (PG-17). Copied from the collection of David J. Lohr, by courtesy of Radioman 1st Class Pamela J. Boyer, USN, 1986. US Naval Historical Center photo # NH 101013. 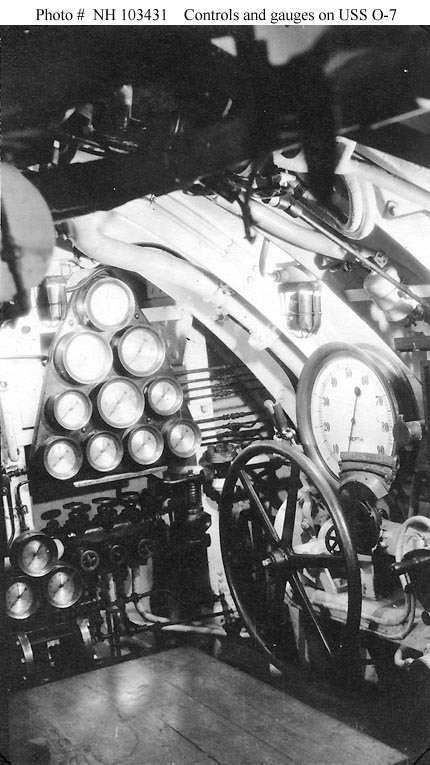 81k Controls and air gauges in the O-7's (SS-68) operating compartment, circa 1918-1919. US Naval Historical Center photo # NH 103431. Collection of Christopher H.W. Lloyd. Donated by Virginia Agostini, 1990. 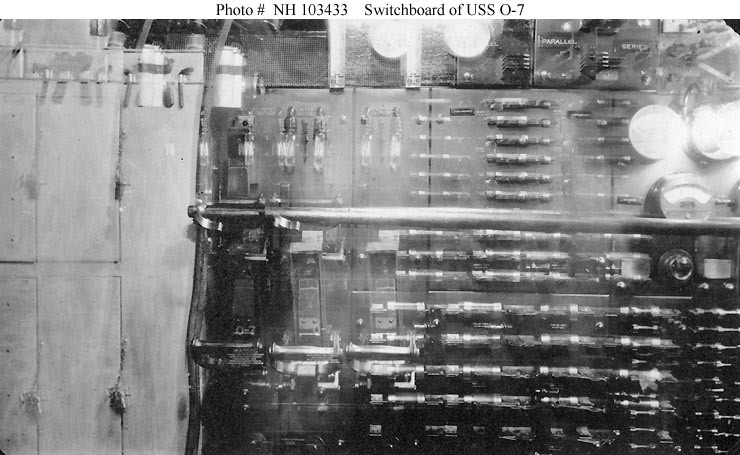 73k Electrical switchboard on board the O-7 (SS-68), circa 1918-1919. Note that this photograph appears to be either a double-exposure or a somewhat blurred time exposure. US Naval Historical Center photo # NH 103433. Collection of Christopher H.W. Lloyd. Donated by Virginia Agostini, 1990. 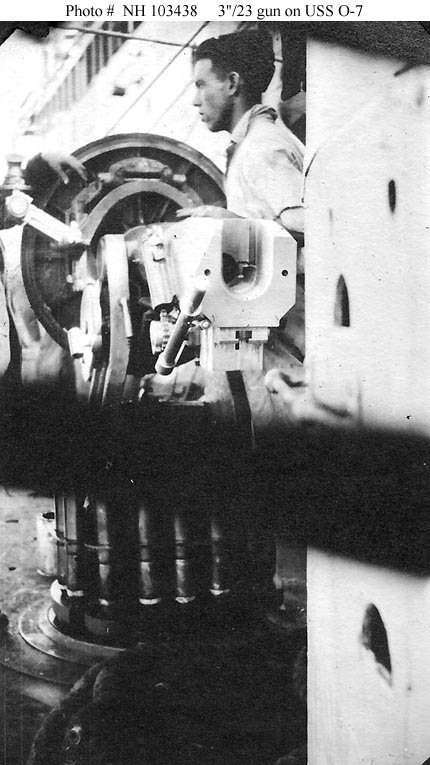 67k Rear view of O-7's (SS-68) 3"/23 retractable deck gun in the raised position, circa 1918-1919. Note the gun's vertical block breech mechanism, round hatch shield, and ready-service ammunition attached to the base of the gun mount. US Naval Historical Center photo # NH 103438. Collection of Christopher H.W. Lloyd. Donated by Virginia Agostini, 1990. 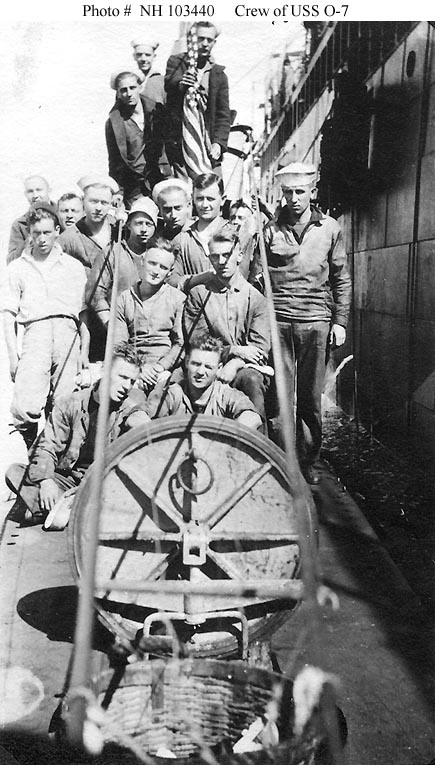 92k Crew members posed on O-7's (SS-68) after deck, circa 1918-1919. US Naval Historical Center photo # NH 103440. Collection of Christopher H.W. Lloyd. Donated by Virginia Agostini, 1990. 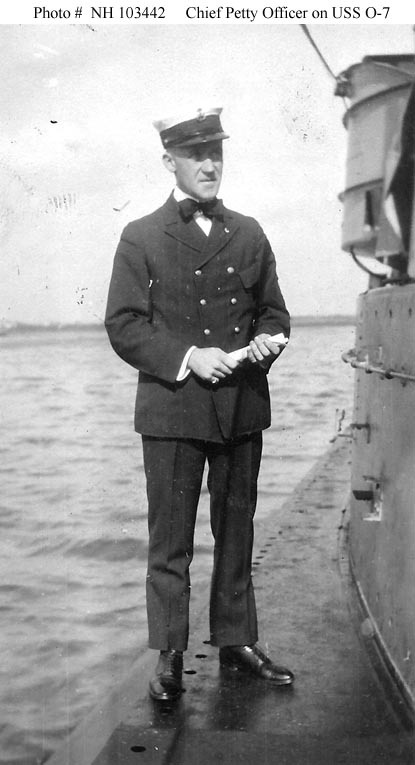 49k Chief Petty Officer standing by the O-7's (SS-68) fairwater, circa 1918-1919. US Naval Historical Center photo # NH 103442. Collection of Christopher H.W. Lloyd. Donated by Virginia Agostini, 1990. 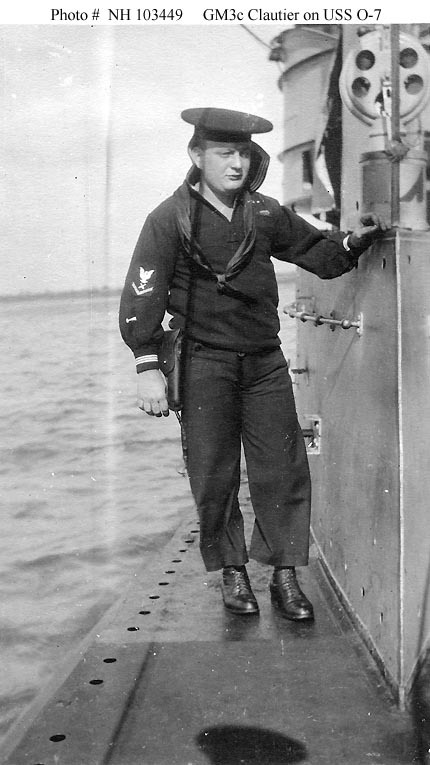 61k Gunner's Mate 3rd Class Clautier armed for guard duty on O-7's (SS-68) deck, circa 1918-1919. Note his blue jumper uniform, "flat" hat, holstered M1911 (.45 caliber) pistol, and gunner's mate and torpedo markings on his right sleeve. US Naval Historical Center photo # NH 103449. Collection of Christopher H.W. Lloyd. Donated by Virginia Agostini, 1990. 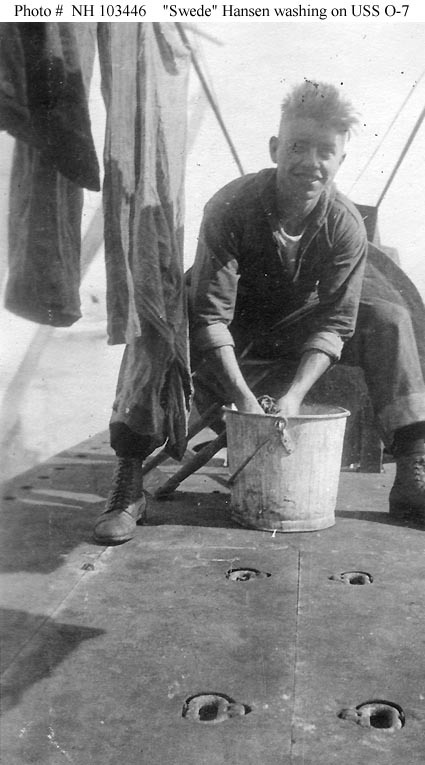 61k Sailor "Swede" Hansen washing clothing in a galvanized pail on O-7's (SS-68) deck, circa 1918-1919. US Naval Historical Center photo # NH 103446. Collection of Christopher H.W. Lloyd. Donated by Virginia Agostini, 1990. The submarine O-7 aground on a sandbar 50 yards off Wilson Point, Fishers Island, N.Y. The crew of 26 were taken off by naval... Image and text provided by University of Utah, Marriott Library. Photo from the The Lehi Sun (Lehi, Utah) 1913-1949, 24 March 1921, Image 7, via chroniclingamerica.loc.gov. 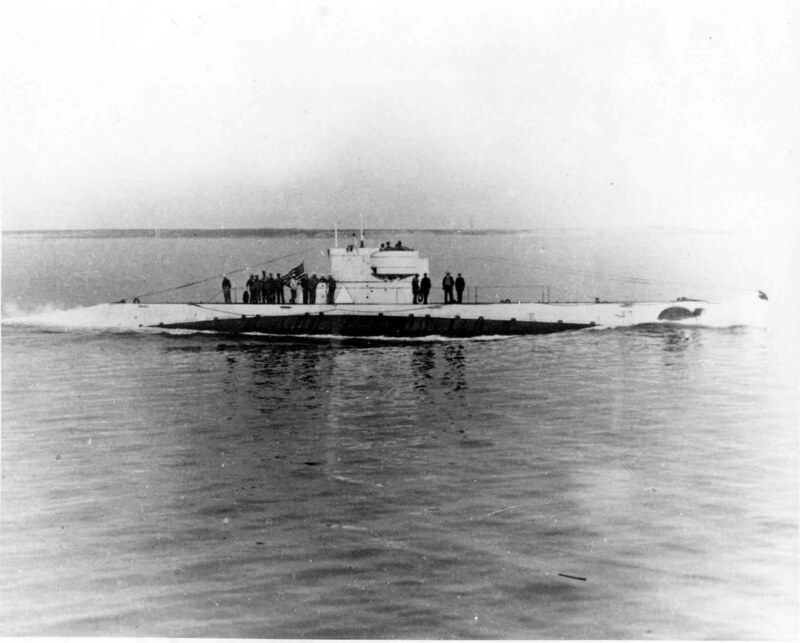 109k O-7 (SS-68) with a partial view of O-6 (SS-67), October 1928. 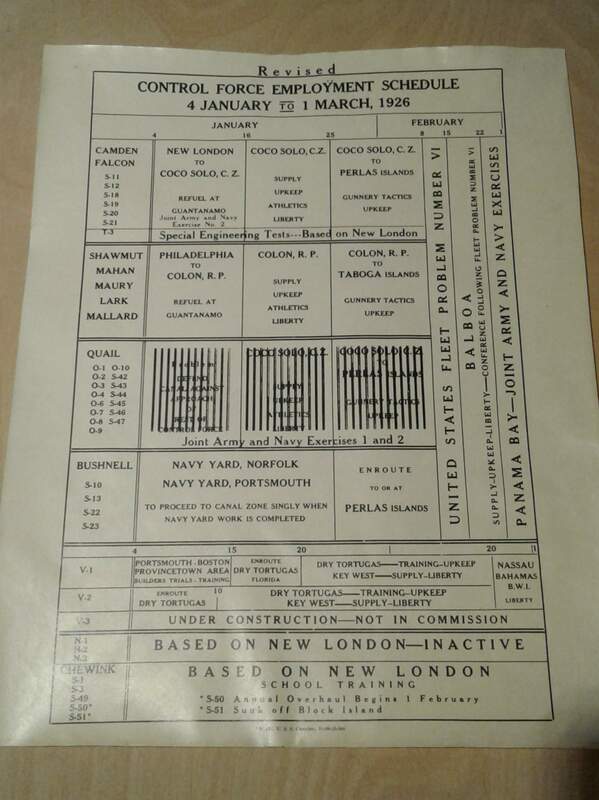 Photo is probably taken when at New London, CT, after she reverted to 1st line sub. USN photo. Partial text courtesy of DANFS. 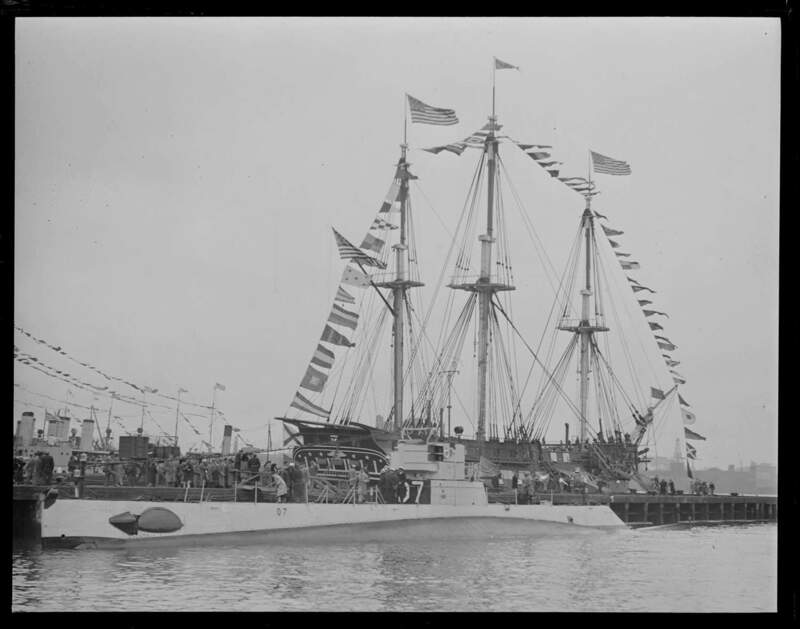 966k O-7 (SS-68) back dropped by the Constitution in Boston harbor, possibly on Navy Day. Photo courtesy of the Boston Public Library, Leslie Jones Collection via Sean Hert & flickr.com. The S boats: S-6 (SS-111), S-7 (SS-112),S-8 (SS-113), S-9 (SS-114),S-11 (SS-116), S-12 (SS-117),S-13 (SS-118), S-14 (SS-119), S-15 (SS-120), S-16 (SS-121), S-17 (SS-122) & S-48 (SS-159). Photo & text courtesy of A.P. Wire courtesy of philly.com. The stadium in the upper left, was John F. Kennedy Stadium (formally Philadelphia Municipal Stadium) that stood from 1926 to 1992. It was erected for the 1926 Sesquicentennial. Photo i.d. courtesy of Ron Reeves (of blessed memory). 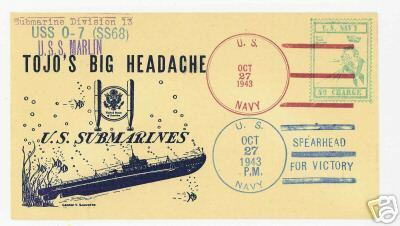 21k Commemorative postal cover honoring Submarine Division 13, the O-7 (SS-68) & Marlin (SS-205), 27 October 1943. Courtesy of Jack Treutle (of blessed memory). 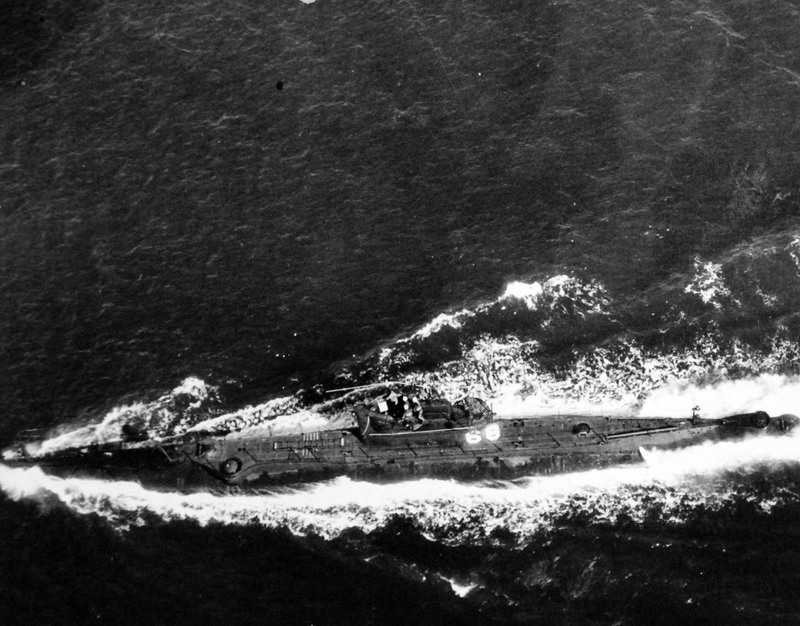 742k O-7 (SS-68) possibly on October 1944 in the Atlantic, south of Fishers Island. Photo i.d. courtesy of Ric Hedman. Photo 80-G-281825 courtesy of NARA via Rob Hanshew and Tracy White @ Researcher @ Large. 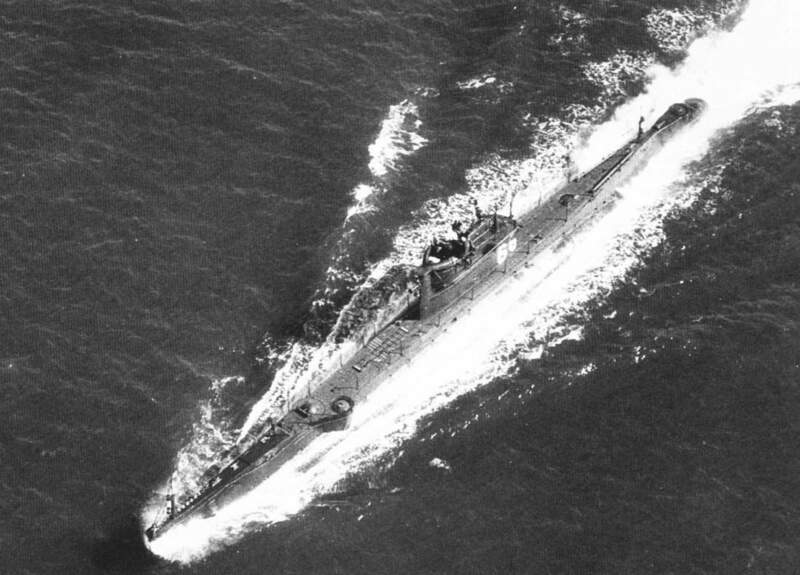 110k O-7 (SS-68) is shown on October 1944 in the Atlantic, south of Fishers Island. 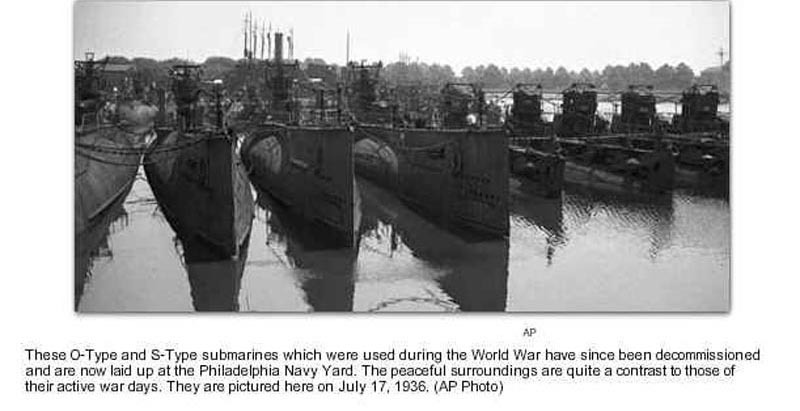 Photo & text courtesy of U.S. Submarines Through 1945, An Illustrated Design History by Norman Friedman. Naval Institute Press.